A 26-year-old Indian man presented with sudden loss of vision, pain, and swelling of the right eye after a blast injury from a firecracker while celebrating Diwali (Figure 1). On examination, BCVA was < 20/400 OD and 20/20 OS. IOP and anterior segment evaluations were normal in each eye. Posterior segment evaluation of the right eye revealed vitreous hemorrhage with premacular hemorrhage and a large area of commotio retinae extending from the 11 to 2 clock positions. The posterior segment in the left eye was normal. The patient was prescribed bed rest, topical steroids, and topical mydriatics along with systemic NSAIDs and was asked to return for follow-up after 2 weeks. At 2 week followup, BCVA was still <20/400 OD. 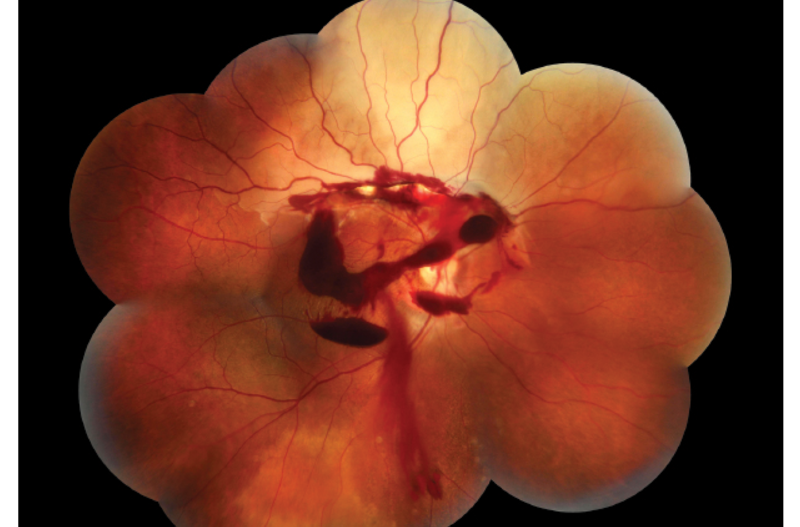 Posterior segment evaluation revealed reduced vitreous hemorrhage with persistent premacular hemorrhage and atrophic changes superiorly in the area of commotio retinae (Figure 2). 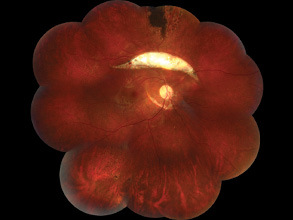 There was also a giant choroidal rupture, part of which could be seen superior to the arcades. We decided to continue to observe the patient to allow spontaneous resolution of the premacular blood. However, the hemorrhage persisted, unchanged, even after 1 month. We then opted for surgical removal of the blood. At the time of last followup, 2 months postoperative, BCVA was 20/20 OD. 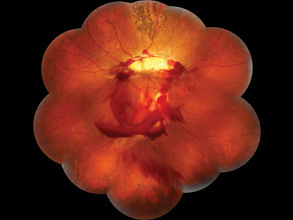 The retina was well attached with an atrophic patch superiorly and two choroidal ruptures, a giant extramacular choroidal rupture superiorly, and another smaller juxtapapillary rupture temporal to the disc (Figure 3). Firecracker injuries during Diwali are seen often in India. 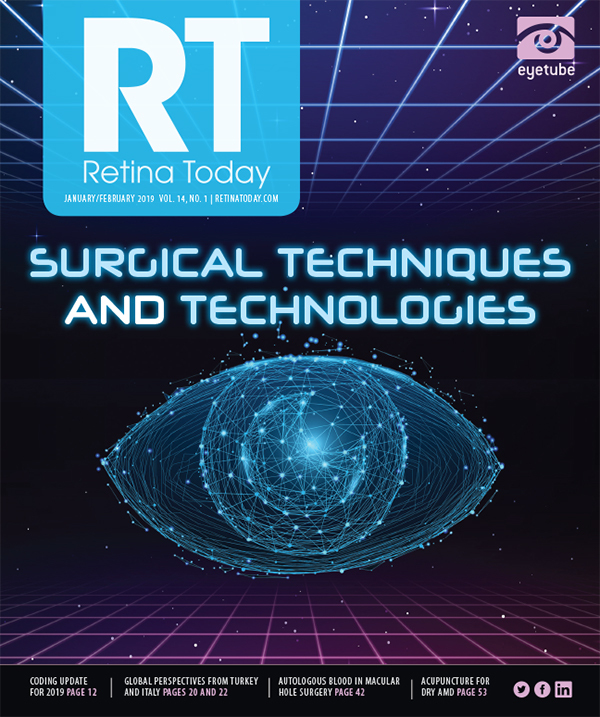 Although it is common to find thermal or chemical injuries to the anterior segment or corneoscleral damage from penetrating trauma, it is not common to find such significant damage limited to the posterior segment after a firecracker injury. It is notable that our patient had damage to the posterior segment only and strictly to his right eye. This case further highlights the risks associated with careless handling of firecrackers during festivities. To share an image, contact Dr. Nagpal at drmanishnagpal@yahoo.com. Note: Images should be 400 dpi or higher and at least 10 inches wide.